Okay, so you know how I made this list? Though I've only watched 10 min. of Terriers so far, which I liked, but it was getting late when I started it. That's the way things go, sweetheart. NPs focus so much on their more popular shows that others get lost in the shuffle. I know that I'll be downloading a LOT this year because of scheduling conflicts. I just learn to roll with it. You know, one thing living overseas has already taught me...I CAN actually live without tv LOl. I don't have any idea what shows are premiering when and the thought of trying to *cough* acquire all the shows I want to watch..just makes me want to wait until they are out on DVD. I can think of three right off the top of my head that I will probably make a concerted effort to *cough* acquire, but other than that...I'll probably wait for dVD. LOL, it must be the difference between us, because one of the years I lived in Japan, I watched 20 shows! (I had just discovered torrents, hah). I don't think it would stop me now either! Oh, wow. I watched Hellcats and Nikita last night. I've already decided I'll try watching those shows. I was even having crack fantasies of Community's Britta as a spy a la Nikita. It could happen! In the one episode, she did say she had some anarchist days. What if something from her dark past came back... dun dun dun! And Nikita is on my DVR for viewing this weekend! Having only watched 10 minutes, I don't even know why it's called Terriers! There's a dog in the first part, but I don't think/know if he's a regular. What got me interested is critical praise and the guy who played Rene in True Blood being one of the leads! I AM SUCH A JUNKIE. It is getting good reviews, and yes, I thought that was Rene! Try Shattered! It's a Canadian show, so you can download it. 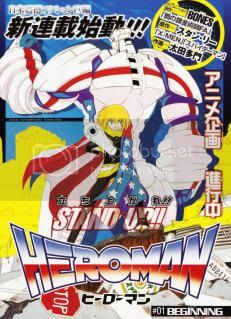 May I interject and suggest Stan Lee's "Heroman" (ヒーローマン) anime show? It's a collaboration between Stan's POW!Entertainment, Womax and Studio BONES to create an original anime featuring American comic book action - plotted by the father of Marvel Comics himself. The show makes for entertaining viewing and is full of Stan Lee tropes (Joey Jones, anyone?). You can watch it legally subbed on Crunchyroll.com, with episode one available here. It's 24 episodes into its 26 episode run (which I hope gets renewed for another season). Did I mention the Secret ID Pr0n? So yeah, here's some clips (the second one is flipped left-right in order to avoid YouTube's copyright policy). Downloadable avi or mkv files exist from the usual fansubbing suspects, though streaming from Crunchyroll is free. There are some scenes of violence and horror (due to the alien invasion involved in the plot) of the series. A couple of these could be frightening to some youngsters, but the show is aimed in general at the 10-15 crowd. I wouldn't imagine there'd be too much cause for concern with Ashlyn watching, but you might want to check the content first if you're at all concerned. That said, Stan Lee is working on getting the show broadcast dubbed into English in the US in the next year or so. No details yet, but I do hope he gets to voice himself. I haven't gone looking for fansubbing sites in ages (2003-ish?)... have any recs? She watches Ranma 1/2 and loves it, so probably it's okay. OK, if Ranma 1/2 is fine, then Heroman DEFINITELY is. Sites to check are mostly torrent sites: AnimeSuki.com, TokyoTosho.info and company are all the best places to find them. You can also check subbers for their releases directly. At the moment, "Commie Subs" produce the best subs for the show, but have stalled at episode 12. The next best English subbing team, "Darksoul-subs" is up to episode 23 at time of writing.